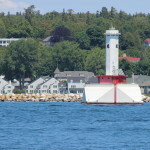 The Straits of Mackinac are home to some of Michigan’s most beautiful and noteworthy lighthouses – Old Mackinac Point Lighthouse, Round Island Lighthouse, Bois Blanc Island Lighthouse, McGulpin Point Lighthouse, White Shoal Light, and Waugoshance Light are just a few of them. 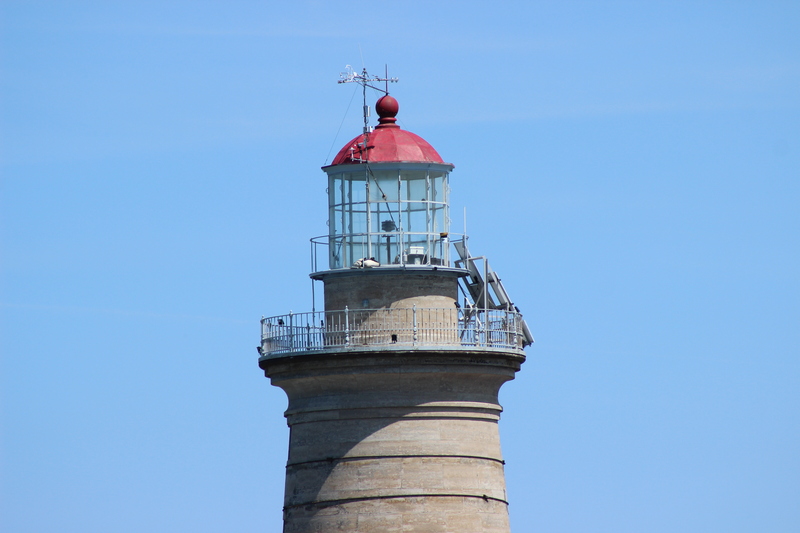 Today we’ll be focusing on the Spectacle Reef Light, which can be found in the north end of Lake Huron and to the east of Bois Blanc Island. 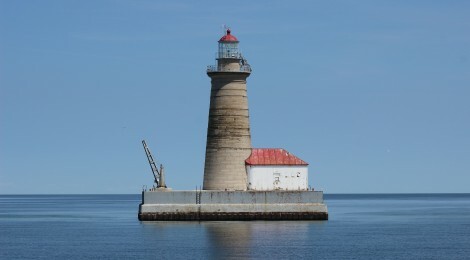 The light warns of a limestone shoal and shallow water, and was the most expensive lighthouse built on the entire Great Lakes. 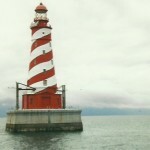 Several ships fell victim to the shoal before the lighthouse was constructed, and having a lightship parked there proved to be ineffective and somewhat dangerous. 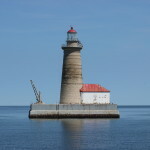 The Spectacle Reef Light entered service in 1874 after four years of construction. 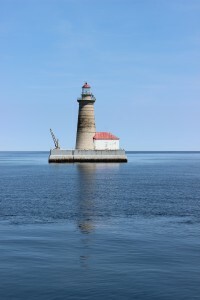 The remote location and weather made construction difficult, but the finished product is a lighthouse that has stood the test of time quite well. The tower is 80 feet tall and it rests on a thick concrete base. The tower is constructed of light colored brick and topped with a red lantern room, while a small attached building is white with a red roof. 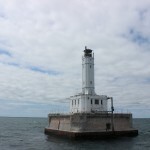 The light’s location makes it challenging to visit, but options include private boat, seaplane, or the Shepler’s Ferry Eastbound Lighthouse Cruise (Extended) that runs out of Mackinaw City. 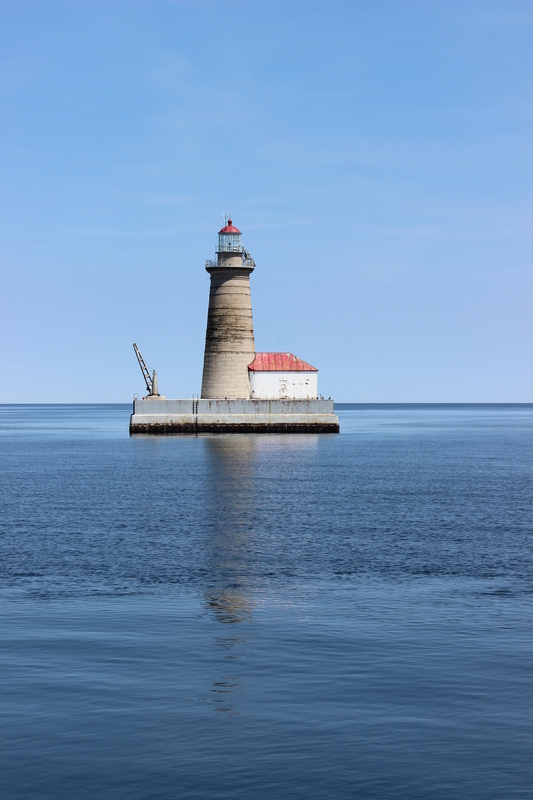 You can check out our photo gallery from a 2015 Shepler’s trip to see more pictures of the other lighthouses on that cruise. The Spectacle Reef Light is such an iconic one that it was included in a 1995 U.S. Postal Service stamp set of Great Lakes Lighthouses. It was chosen to represent Lake Huron, and was one of just two Michigan lighthouses included (St. Joseph Pierhead/Lake Michigan was the other). You’ll find this light and 24 others included in our recent post, Michigan Bucket List: Lighthouses.